LOGAN SQUARE — Hold on. Don't throw away those melon peels, steak trimmings and dried cheese-encrusted pizza boxes just yet. Bring them to the Logan Square Farmers Market on Sundays. The market has started a home composting program in partnership with City Farm, one of its vendors. It works like this: Buy a three-gallon bucket (with lid) at City Farm's stand, take it home, fill it with food scraps and return it to City Farm at the market the following Sunday. Get a clean bucket. Repeat. A subscription for the rest of the market's summer season, which ends Oct. 25, is $65 if you sign up this coming Sunday. That works out to $5 a week. Or, pay as you go for $6 a week. One difference between this and other composting services is that pretty much all food waste — and recyclable paper waste soiled by food — can be tossed in the bucket to be turned into rich soil, said Mae Bowley, City Farm's market manager. This includes used cooking oil, past-its-prime milk and meat scraps, as well as dirty paper plates and napkins from your backyard barbecue. (Regular paper should still go in the recycling bin, Bowley said.) Wax, plastic and metal are off-limits. City Farm is a project of the nonprofit Resource Center, which runs a restaurant composting service and recycling programs across the city. "Our compost system is so large, robust and well-developed. We get tons of scraps from restaurants and businesses, so this is a drop in the bucket for us," Bowley said. Home compost collection programs are gaining ground nationwide. San Francisco and Seattle are among the cities that require residents to compost their food waste and offer residential compost pickup. Chicago doesn't yet have a citywide program like that — only lawn trimmings and yard scraps are allowed for compost pickup by the city — but it's something the Resource Center and local food advocates are working toward. In 2013, the Andersonville neighborhood ran a community-wide home compost pickup program as a six-month pilot project. Ravenswood this month launched a similar program starting with restaurant food scraps, with the goal of expanding to homes. Privately run compost collection services include Collective Resource and The Urban Canopy. Green City Market has a dedicated compost area during its market days but does not collect shoppers' home compost. "We hope to develop such a program in the future," the website reads. 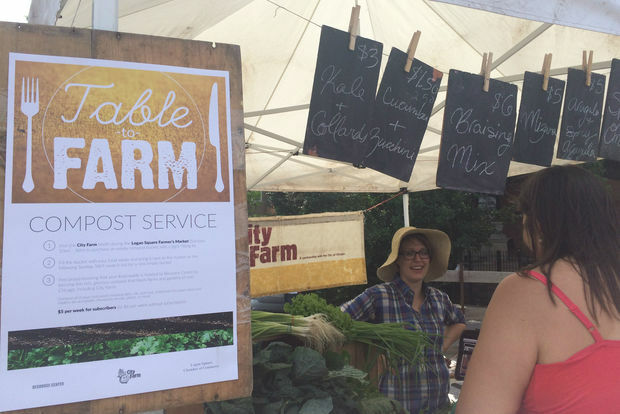 The ease of City Farm's service is what prompted to roommates Abena Boamah and Emma Kornhauser to sign up Sunday. They were the first to do so. By the market's end, four more people had signed up, Bowley said. 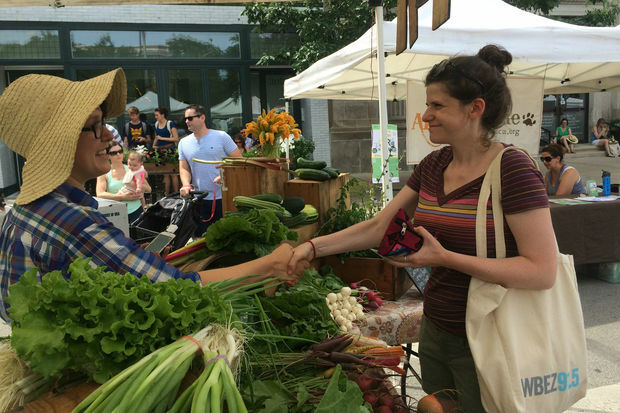 Boamah and Kornhauser, who live in Logan Square, shop regularly at the farmers market and have a Community-Supported Agriculture share. They recycle at home but have found composting to be a challenge. They just don't have the space. "There can be a lot of rinds and peels and leaves," said Kornhauser, 24. The other day, Kornhauser made a stir-fry with kohlrabi and said she felt guilty after tossing the peels, though she did save the leaves and planned to find a recipe for them. City Farm's program "makes it a lot easier on us. We don't have to think about it that much," she said. Bowley said the compost program is a "beta test" that might extend to the winter season. For more details, go to the City Farm website or their booth at the Logan Square market, or e-mail cityfarm@resourcecenterchicago.org.